In this tutorial I will describe some simple use of the timevar() option when obtaining predictions after fitting a model using stpm2. When using Stata’s survival models, such as streg and stcox, predictions are made at the values of _t, which is each record’s event or censoring time. This is the default behaviour of stpm2. One of the advantages of parametric survival models is that we can predict various quantities (hazard, survival functions etc etc) at any value of time and for any covariate pattern as we have an equation which is a function of time and any covariates we have modelled. Before I show some examples I should explain that we need to be a bit cautious when making such predictions. In Stata it is only possible to have one data set in memory. When we make predictions at specific values of time using the timevar() option we effectively want a second data set that we can use for predictions, and then use for producing graphs and tabulations. We have found it easiest to think of two data sets side by side as shown below. This means that we have our analysis data and our prediction data stored in the same data set. We have to remember that there are actually two (or more) data sets and that row 1 or the analysis data does not have a relationship with row 1 of the prediction data. I now will illustrate the use of the timevar() option. I first load and stset the rott2b data. I will model the effect of age using restricted cubic splines. These can be generated using the rcsgen command. I make use of the center option make the created spline variables all equal 0 at the specified value, in this case at age 60. I then fit an stpm2 model including the effect of hormonal therapy (hormon), progesterone receptor (transformed using $\log(pr+1)$), and age (using the 3 created restricted cubic spline variables). I now create some values of time that I want to predict at. I use the range command to give 100 values between 0 and 5 in a new variable tt. After creating the new variable I can use it in the timevar() option when using stpm2’s predict command. This will predict the baseline survival function at the time values in the variable tt. The zeros option sets all covarites equal to zero, i.e. the baseline. The ci option asks for the upper and lower bounds of the 95% confidence interval to be calculated. The function can now be plotted. Combining with the at() option. It is possible to make predictions at any values the covariates included in the model using the at() option. The two lines below predict the hazard functions for women using and not using hormonal treatment at the reference age (60) and the mean value of log progesterone receptor (3.43). I have used the timevar(tt) option again and so predictions will be at the 100 value of tt (actually at 99 values as the hazard is not defined at t=0). The at() option gives the values of the covariates that we want to predict at. The zeros option will set any remaining covariates equal to zero, i.e. the age spline variables are set to zero which is the reference age of 60. The per(1000) option multiplies the hazard rate by 1000 as it is easier to interpret the rate per 1000 years than per person per year. As the model assumes proportional hazards the predicted hazard functions are perfectly proportional. Predictions at single values of time. It can be useful to see the variation in survival at specific values of time, for example at one and five years. The followig code predicts the survival at one year for all subjects in the dataset. This can then be plotted in a histogram. We can compare this to the variation at 5 years. 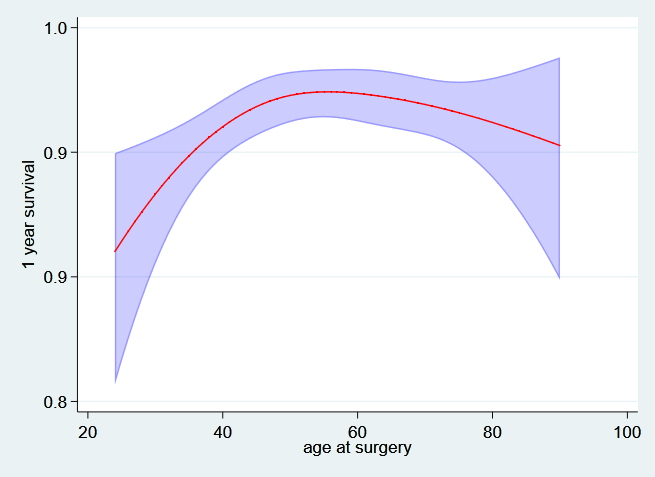 If we are interested in specific covariates then we can look at 1 and 5 year survival as a function of that covariate. 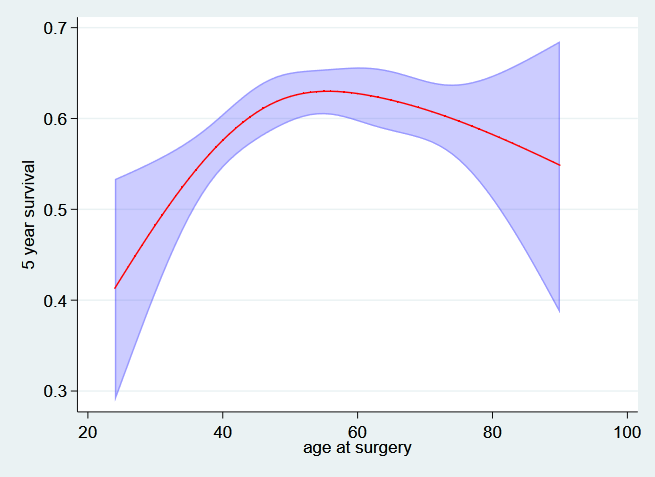 For example, we can plot the 1 and 5 year survival as a function of age at diagnosis. As this will also depend on the values of the other covariate I will fix these at specific values (not on hormonal treatment and at the mean level of log progesterone receptor). And now the 5 year survival….